Suspect wanted for arson at Germantown corner store on Nov. 20, 2018. 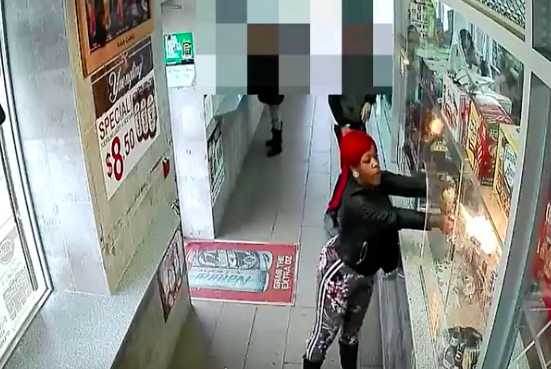 A Germnatown corner store nearly went up in flames when a woman attempted to set the front counter on fire using a lighter and a can of hairspray, according to Philadelphia Police. The incident occurred Nov. 20 at a store in the 2100 block of West 65th Avenue. Several items were burned but there were no injuries reported. Authorities described the suspect as a black female in her mid 30s to early 40s, about 5 feet 5 inches tall with a slim to medium build. She was last seen wearing grey tights with a floral pattern, a black jacket and black boots. She had red hair and wore round earrings at the time of the incident. Anyone with information about this suspect is asked to call 911 or contact Philadelphia's Arson Task Force at (215)-446-7874.